Charley's Vegetables And Herbs | Growing Charley's Vegetables and Herbs for great tasting garden vegetables. There is just something about sitting down to eat a dinner that is made up of vegetables and herbs grown in your own garden. There is a bit of nostalgic pride in being able to say, “I grew that tomato,” when you have your friends over for a cookout and they comment on how good their burger is. Charley’s Vegetables and Herbs are an exclusive line of the most popular and tasty vegetables and herbs, all of which have been picked for their great taste and reliable garden performance. Charley’s Vegetables and Herbs are grown by Parks Brothers Farm Inc. and sold exclusively through independent garden centers throughout the mid-south. Take a look at our About Us page to learn more. 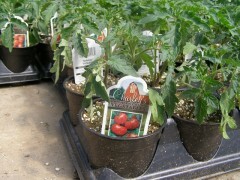 You can also click here for a list of garden centers that carry Charley’s Vegetables and Herbs.